Many people have heard of root canal therapy, but there are plenty of misconceptions about what it involves. That makes sense given how much incomplete and bad information there is on the internet and TV. When you meet with a skilled Manhattan cosmetic dentist for a dental visit, you may find out that you need a root canal and might fret for no reason. That's why we want t give you the basics about root canal therapy right now. Knowing the basics will allow you to alleviate worry when it comes to this common dental procedure. Let's look at the anatomy of a tooth first. Inside every tooth is a hollow part known as the pulp chamber. In this pulp chamber is soft tissue that contains nerves and blood vessels leading down through the tooth root into the jawbone. When the dental pulp becomes infected as a result of major tooth decay or tooth injury, the dental pulp must be removed to save the tooth. That's when our Manhattan dental care experts perform a root canal. When the bacteria that naturally occurs in the mouth infects the dental pulp, it causes severe pain and discomfort. If the infection spreads too far, it will result in major pain and discomfort for the patient, and major general health issues later on. Removing this infected dental pulp is the only way to alleviate this pain, save the tooth from extraction, and prevent further infection of other structures in the mouth. The best candidates for this general dental care treatment are people who have severe tooth pain as a result of infected dental pulp. The need for a root canal will be determined during the consultation process. During this restorative dentistry procedure, the tooth and area around the tooth is carefully numbed so that there is no undue discomfort. The tooth is then carefully drilled so that the dentist can access the pulp chamber. The dental pulp is extracted and the pulp chamber sterilized. Once that is completed, the pulp chamber is then filled with an inert material to make sure it is structurally sound and then capped with a dental crown. 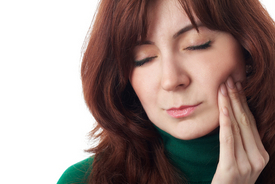 Do root canals hurt as much as people say they do? No, not nearly as painful as some would lead you to believe. Thanks to advances in dental care technology and pain management techniques, root canals do cause discomfort, but it is easily managed during the procedure through the use of local anesthetic and after the procedure through the use of pain medication. If a tooth is too decayed to be saved, it will need to be extracted in order to prevent the spread of infection. In these cases, sometimes Manhattan dental implants will be used to help support a dental bridge or dental crown as a replacement tooth. We can discuss candidacy for implant dentistry in more detail during your visit to the practice. For more information about root canal therapy and your many other options for advanced dental care treatment, be sure to contact our Manhattan cosmetic and restorative dentists today. Our entire team looks forward to meeting you in person and helping you achieve excellent dental health.